A few years back I learned how to make dumplings from a Taiwanese friend. 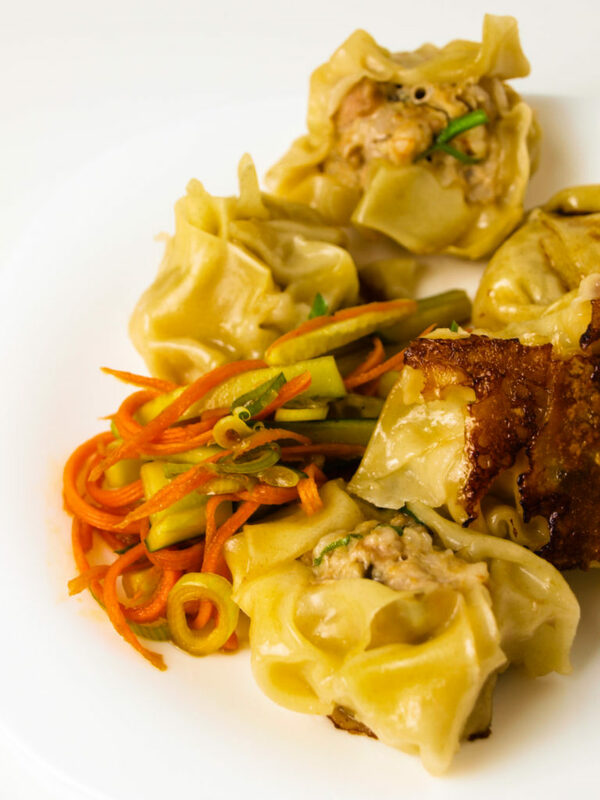 He not only told me how to make the most awesome filling using pork belly, but also taught me how to prepare them in the most delicious way – gyoza style – also known as pot stickers! This means pan-frying and steaming them at the same time! It gives them such a delicious crunchy bottom while perfectly steaming them on top! And once you bite into that crunchy marcel you’ll find fatty succulent pork, shrimp, shiitake mushrooms as well as a hint of ginger, sesame and spring onion. What could be better? Recently I made them together with my neighbor who was not only impressed how easy they were to make, but especially how incredibly tasty they were! Though I can’t fully agree, they are really juicy, delicious and oh so succulent! You can get pre-made deep-frozen dumpling wrapper in every local Asia store. Try to get the gyoza-style ones, as they are thicker. Get some wrappers, make some filling, invite some friends and let them do the work! Making dumplings is fun and easy to do in a small group. This will also help to ensure all of you can feast on the cooked dumplings faster! Whip up one or two easy dipping sauces and you are all set for a great evening! (two of my favorites are at the bottom of the post). In the photo I made little open-faced dim sum, which are not the traditional gyoza way. The right way is to fold them into a half-moon shape with some decorative creases. But hey, don’t be so strict to yourself. Do whatever feels right! If someone makes rough comments on the shape of your dumpling, tell them it’s your way of artistic expression! Dice up the pork belly into very small cubes (0,5 x 0,5cm), do the same with the shrimps. Finely slice the shiitake mushrooms and the spring onion. Peel and grate both garlic and ginger. In a big bowl, mix pork, shrimp, mushrooms, spring onion, garlic and ginger, together with the sesame oil, soy sauce, sake as well as some salt and pepper. Stir and mash lightly to combine. If you would like the consistency to be finer, you can put everything in a food processor and pulse a few times to combine it. Hold a gyoza wrapper in one hand and put a tablespoon of filling into the middle, keeping the sides of the wrapper clear. Add one cup of water to the pan and close with a lid immediately. The steam will cook the dumplings to perfection. Proudly serve your silky but also crunchy dumplings with some dipping sauces and feast together with your friends! Tangy dipping sauce: Combine 3 tablespoons of soy sauce with 1 tablespoon of rice vinegar and 1 teaspoon of grated ginger. Sweet and spicy dipping sauce: Combine 3 tablespoons of soy sauce with 1 teaspoon of brown sugar, 1 teaspoon of sriracha (or other hot sauce) and some chopped spring onions. Let me know in the comments what you think of the recipe! Do you have an even better filling for dumplings? Do you simmer them in soup or steam them? All your comments are welcome!